town of Shelburne in Nova Scotia. Fingers crossed, we get to continue on with our journey today - hopefully beyond Lunenburg! The loose plan is to make it at least as far as Cape Sable Island, the most southern point in Atlantic Canada. We headed out on the main highway and made good time. Our first point of interest was to be the town of Lockeport the location of Nova Scotia's first registered streetscape. Relatively short, the street is made up of several historic houses built by the Locke Family at various times during the 1800's and early 20th century. Back along the road a short way, the yellowish-white sand of Crescent Beach stretches out invitingly - beaconing for visitors to walk bare-footed in the warm sand. The Atlantic Ocean with its rhythmic motion and clarity also looks inviting and a tentative toe dipping confirmed our suspicions of frigid water. 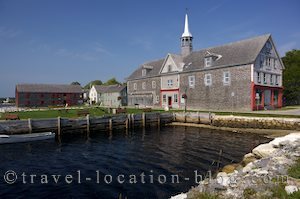 Next stop along the southern coast of Nova Scotia was the town of Shelburne which was founded by British loyalists, freed Blacks, and soldiers of His Majesty's Loyal Troops. The town was first named Port Roseway until the arrival of the loyalists in the mid 1700's. A number of houses and buildings still exist along the waterfront - a brief glimpse into the town's heyday when the population exploded to 16,000. The boom did not last long and the population was reduced to only 300 families by 1800. Cape Sable Island sure bears the brunt of fog - the sky went from clear blue to fog the minute we crossed over the bridge to the island. In short, we couldn't even see the shoreline beside us let alone the lighthouse so headed back out the way we came only stopping briefly at a scenic point near Clark's Harbour where interesting channels had formed in the river. We headed out of town back towards the main highway then turned down highway 335 towards Pubnico Point, an Acadian settlement area, to find our campground for the night. We found our spot and the host was extremely helpful and explained a few points of interest in the area such as the windmill park near the end of the peninsula only 10 minutes down the road. With the fog closing in we decided to head out to the point to see what the scene looked like anyway. It was quite interesting - the fog and sun were playing tag while the windmill blades moved in constant rhythmic rotation. These windmills are just massive at a height of 78 metres - it's an amazing sight to see, we were quite blown away.